The role of the microbiome is increasingly recognized as part of wellbeing. The most diverse and significant bacteria community is located in the intestines. It is believed that the manipulation of the microbiota can contribute to treating some diseases. However, to enable it, it is necessary to understand the range of bacteria and how they colonize the intestine. Research in this field has used model organisms, namely mice and fruit flies, which also benefit from this association with bacteria. Now, a study published in PLoS Biology offers a new tool to study this bacteria-host interaction. A research team from the Gulbenkian Institute of Science (IGC) revealed how the bacterial community colonizes the fruit flies in the lab or in the wild, and the impact of this colonization in nature. Understanding these mechanisms of colonization may allow microbiota manipulation in agricultural pests or disease vectors like mosquitos. 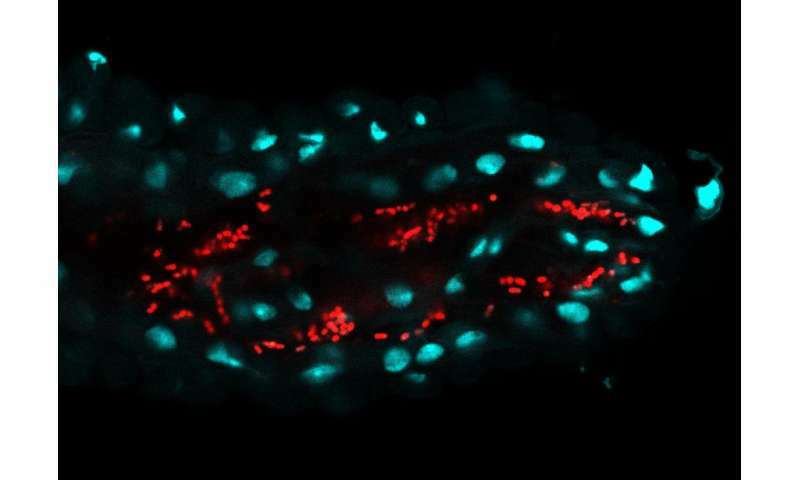 Until recently, it was assumed that the fruit fly (Drosophila melanogaster) did not have a stable bacterial community in its intestine. Gut bacteria would need to be continuously ingested with food. A research team led by Ines Pais, researcher at Luis Teixeira's lab from IGC, has now demonstrated that fruit flies have a bacterial community much more stable than previously believed. But there are differences between flies kept in the laboratory and from the wild. Laboratory flies—globally used in research studies—are associated with bacteria not able to colonize the intestine. Instead, these bacteria grow in the flies' food and are regularly ingested by them. The IGC team discovered a very different situation related to wild flies. They showed that bacteria associated with wild flies have a much higher colonization capability. Curiously, these wild flies' bacteria are able to colonize the intestines of flies kept in the lab. By focusing on one of these bacteria, the researchers showed that a stable and continuous colonization of the intestine causes a constant transfer of bacteria to the environment, benefiting the following generation. "The fruit fly practices a kind of farming by transporting with them the bacteria that are sown in the area where the next generation will grow and feed. Doing so, the next generation of flies will obtain all the benefits related to these bacteria for their development and fertility," explains Ines Pais. "This interaction is also similar to what happens when human beings use yeast to bake bread, or bacteria to make yogurt," adds Luis Teixeira, principal investigator of the research group. Regarding why fruit flies were used to study the way that bacteria colonize the intestine, Luís Teixeira says: "The bacterial community in fruit flies is much smaller and simpler than in mammals. Also, it is relatively easy to produce fruit flies without any bacteria, which facilitates the study of colonization. Since similar biological mechanisms exist between the fruit fly and humans, we think that there are many lessons that we can learn from the fly." The researcher alerts also points out that many insects have a devastating role in agriculture or as disease vectors. "Through the manipulation of their microbiota, it might be possible to control these insects or their capability to transmit diseases, for example, Dengue virus and malaria parasites," says Luís Teixeira. Humans live in permanent contact with a huge community of microorganisms, including bacteria, viruses, and fungi. There are many communities on the body's surface and in mucous. The biggest and most diverse bacteria community in terms of bacteria species is located in the intestine. In normal conditions, the microbiota is in balance, providing benefits to the host organism. Our bacteria promote the correct development of our body, the breakdown of nutrients and protect against some pathogens, which can, for example, cause intestinal infections. However, when this balance is disturbed (for example, by using antibiotics), the microbiota species may change. The organism passes through a dysbiosis condition, in which the community may become harmful to health.